With spring cleaning just around the corner, many residents will encounter leftover paint, chemicals, solvents, and automotive fluids that they may not know how to dispose of. These items should never be dumped down the storm drain or in the street because they go directly to our streams, rivers, lakes, and water supplies. There are safer ways to dispose of hazardous household chemicals and automotive fluids that do not threaten our water quality or public health. In an effort to prevent household hazardous waste contamination, Clermont County and the Adams-Clermont Solid Waste District have worked hard to make the disposal of household hazardous waste more convenient for county residents. Disposing of old motor oil, brake or transmission fluid, and antifreeze can be tough. The good news is that residents can bring these used fluids, at no cost, to the Fleet Management garage, located on Filager Road just off SR 222 north of Batavia. These items are accepted Monday through Friday, from 8:00 a.m. to 3:30 p.m.
Other hazardous household chemicals such as paints, thinners, and solvents can also be disposed of properly. Unused latex paint can be left open in the container until dry, then disposed of in general waste. There are also local outlets for other materials, such as tires, car batteries, nickel-cadmium batteries, propane tanks and more. You can search for disposal or recycling locations at http://oeq.net/recycling/. If no local outlets are available, the Solid Waste District will issue Clermont residents a voucher, which allows them to take the material to Environmental Enterprises on Spring Grove Avenue in Cincinnati and the District will pay the disposal fee. To obtain a voucher, or for more information on Solid Waste District programs, call (513) 732-7894 x3. Single-use plastics, or disposable plastics, are used only once before they are thrown away or recycled. These items are things like plastic bags, straws, coffee stirrers, soda and water bottles and most food packaging. Single-use plastic is almost entirely about convenience. Thankfully, there are industries making great strides to reduce their plastic waste. Many airlines have begun recycling plastic cups and straws, and companies such as Nestle and Unilever pledge to make all plastic packaging either 100% recyclable or reusable by 2025. Kroger will be eliminating single use grocery bags as of 2025. Nevertheless, significant progress is yet to be made and much of the effort comes down to us changing our behavior as consumers. Stop buying water in single-use plastic bottles. Get a sink or jug-mounted filter at home. Buy a bottle that you can leave in your car. Or even buy a separate one for your car, purse, office and home. Use cloth or recyclable bags for your groceries. You can find these bags for sale at most retailers, or alot of organizations give them away as free promotional items. Don’t use plastic bags for vegetables you’re going to wash anyway. Earthwise & Purifyou have mesh produce bags available, or skip bagging all together. Bring your own coffee mug to your favorite coffee vendor. Own your own straw, or stop using one. Paper, metal, and glass alternatives exist. Stop using ziplock bags and use glass or Tupperware instead. Even plastic Tupperware is made of recyclable (and even recycled) material! Rinse out and recycle your plastic bottles. These can be recycled many times when properly disposed. Participate in litter / river cleanups…. Clermont County has a Spring Litter Cleanup on April 13, 2019. See our website for updates: https://www.clermontswcd.org/. Lobby your local and state government to make recycling a priority. You can go to https://www.legislature.ohio.gov/legislators/district-maps to find out who your state representatives are and how to contact them. In total, more than 60 countries have enacted plastic bans and/or fees in order to cut down on plastic waste, and many more are likely to follow soon. Let each of us do our part to cut down on plastic waste. Pictured: Greg Nause hosting a cover crop field day. 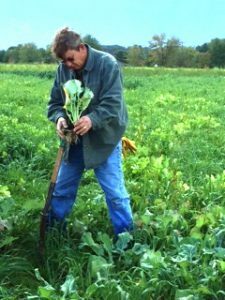 The Soil and Water Conservation Districts in Brown, Clermont, Clinton and Highland counties are working together and looking for farmer input to develop a new website, the Southwest Ohio Agricultural Conservation Menu (SOACM), to share information on conservation programs and technical services that are available locally to advance farming practices. The SOACM website will be a one-stop clearinghouse for all conservation programs. The site will also include information and regular updates on watershed health and local water quality monitoring efforts. The intent of the SOACM website is to provide local farmers with the services and information they need to choose the right agricultural Best Management Practices (BMPs) that can advance their farming operations and provide protection for local rivers and lakes. If you’re interested in participating in this project, please register here or call the Clermont SWCD: (513) 732-7075. Register below to participate in 2019 Focus Group Meetings! Attention Farmers and Landowners in Clermont, Brown, Highland & Clinton counties: If you're interested in participating in local focus group meetings to improve conservation practices and expand access to technical services and local resources, please sign up today! Meetings will begin in early 2019. We need help keeping the Ohio River clean! Clermont County is seeking a coordinator for the Ohio River Sweep held each year on the 3rd Saturday in June. 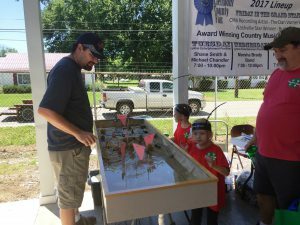 The Sweep Coordinator would be responsible for promoting the event, registration and delivering cleanup supplies from ORSANCO to the site coordinators in New Richmond, Moscow, Neville and Chilo. The coordinator usually dedicates about 40 hours total to organize the event. This is a paid position through Valley View Foundation, which will provide support to the coordinator. If you are interested, contact Vanessa Hannah at vhannah@valleyviewcampus.org, or at (513) 218-1098. Special Thanks to: Shaw Farms, JD Equipment, Clermont YMCA, Carneys Feed Mill, Pilot Todd Winemiller, Old Firehouse Brewery, Grant’s Farm & Greenhouse, Buckeye United Fly Fishers, Clermont County Visitor’s Bureau, Jones Fish & Lake Management, Southern Ohio Association of Realtors and Clermont SWCD’s Amazing Supervisors! 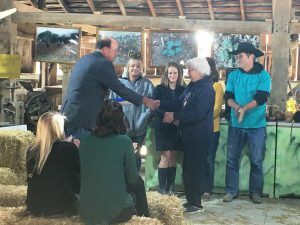 On October 11, David Daniels, the Director of the Ohio Department of Agriculture, visited Clermont County to recognize Shaw Farms in Miami Township as an “Ohio Bicentennial Family Farm.” This extraordinary designation identifies Shaw Farms as being owned and operated by the same family for over 200 years. Founder Thomas Shaw moved to Clermont County from Bucks County, Pennsylvania in 1807 when he purchased 68 acres in Miami Township. The following year, Shaw purchased an additional 63 acres from none other than General William Lytle, who some recognize as the “Father of Clermont County.” Thomas’ son, James Shaw, purchased the current property in 1834. His son, William, helped run the farm until he was captured during the Civil War and died at the notorious Andersonville prison camp. Today, Shaw Farms is run by members of the family who are six to eight generations removed from the founder, and is led by matriarch Jean Shaw, who at age 87 still works full days at the farm. The future of the farm is in good hands, with ninth and tenth generation children living and playing on the farm. Shaw Farms is perhaps best well known for the produce they sell and their annual Fall Festival, which includes a corn maze, an interactive playground, hayrides and more. This year’s festival runs from September 15 through October. 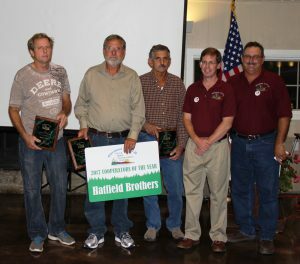 In addition to Director Daniels, certificates of achievement were present to Shaw Farms by Senator Joe Uecker on behalf of the Ohio Senate, Representatives John Becker and Doug Green on behalf of the Ohio House of representatives, and Commissioner David Painter on behalf of the Clermont County Board of Commissioners. Shaw Farms, located at 1737 SR 131, Milford, is holding its annual Fall Festival through October. The features a huge corn maze with a kid-friendly treasure hunt, two interactive playgrounds, horse and tractor drawn hayrides, pumpkins and fresh produce. Hours are from 9 a.m. through 7 p.m. For more information on Shaw Farms, visit their web site at www.shawfarms.com. Fair goers were given the opportunity to meet (and play) with representatives from the Clermont SWCD along with ODNR Division of Wildlife and Parks, Brown County Beekeepers, National Wild Turkey Federation, Clermont County Parks, Ohio Trappers, and USDA-APHIS-Asian Longhorn Beetle experts during the Natural Resources Day held at the Clermont County Fair. Archery, BB-guns, reptiles, and other exhibits were on display along with our own stream table (see photo on right) and paper recycling station for people to interact with. Thanks to everybody who stopped in and made it our largest event to date! In June, 2014, Governor Kasich signed the agricultural fertilizer applicator certification law (Senate Bill 150), requiring farmers who fertilize 50 acres or more to become certified by September 30, 2017. Under the certification law, fertilizer is considered to be any substance containing nitrogen, phosphorus, potassium, or other plant nutrient in a dry or liquid formulation. Lime and limestone are not considered fertilizers. All application types (broadcast, side dress, sub-surface, knifing, etc.) are included in the certification requirement. The only application exempted is start-up fertilizers applied through a planter. All certifications will be valid for three years. After the deadline, the Ohio Department of Agriculture (ODA) will conduct random record audits. Algae, especially hazardous algae blooms, across the state was the main reason for this law to be enacted. Aquatic habitat health, recreational value and drinking water are inhibited by high nutrient amounts in our waters. This is a problem that affects everyone within the watershed where these issues occur. Nutrient problems are not just related to agriculture, we affect water quality at the household also. Anything we apply to the landscape can be washed into our streams when not done properly. Nutrients from landscaping activities, failing septic systems, and erosion all can contribute to water quality degradation and lead to algae blooms in our water bodies. Remember, things that enter a stream are natural only if we don’t put them there (leaves for example). Below is a list of a few things that can be done to improve our water nutrient problems. The Ohio Department of Natural Resources-Division of Wildlife has an excellent Pond Management Handbook available online for those that own ponds. This free downloadable resource is a must have for pond owners. Inside you will find information regarding fish stocking, fish management, managing aquatic vegetation and other problems and solutions regarding pond health and management. This handbook was made for the typical pond owner, easy to read, many pictures, and geared to issues found here in Ohio. This publication was updated in 2015.